Heading southbound on two-lane Nebraska Highway 14 on an early summer day, airborne cottonwood seeds can be seen wafting past your windshield just a mile before you cross the Beaver Creek bridge and curve past the old train tracks and into the county seat of Albion. On this stretch of asphalt roadway the east ditch’s crown of bromegrass crests a barbed-wire fence and the hill flashes onlookers with acre upon acre of cornrows. It’s there where you’d notice a longstanding roadsign: Farmers Mutual Insurance Company of Nebraska. Schmadeke Inc. Insurance & Real Estate. Low Cost, Dependable Insurance. Which brings us to the Schmadeke twins. Damon and Darren Schmadeke (rhymes with ‘Let it be’), were both low cost (sic), dependable young men, much like their father’s insurance offerings, as both walked-onto the team and steadfastly refused to ever quit the task of contributing to the quest for a Husker championship. One survived the trial and finished his career in pads, whereas the other’s body never quite made the grade, so he later assumed an undergrad coaching position and a sideline polo shirt. Some could (though many couldn’t) distinguish between the two, so just to be safe you always greeted them in passing with a, “Hey, Schmads.” Let’s get to differentiating between these two young Boone County speedsters, piggybacked here one after the other. Question: Hey Darren, I’m trying to remember your first fall camp..
Darren Schmadeke: It was ’91 when I was a freshman. I grew up going to Nebraska football games since I was 6-7 years old. My grandparents had tickets in the family for well over 50 years, they sat in the west stadium and at one point had twelve seats in a row. Over the years they sold them off, but it was amazing. Growing up going to Husker games? I was a fan all my life. And also, we went to the Big Red Football Schools; went there before my freshman, sophomore, junior and senior years in high school. And I think that really helped me and my brother get our names out to the coaches, for them to ask us to walk-on at that time. Q: Who ended up inviting you to walk-on? DS: It was Turner Gill. February of 1991 on the phone, he’s the one who officially asked us to walk on. I’ll never forget that night. Q: Was it a little bit of a surprise? Were you expecting it? DS: I think we were, but it was one of those things where you just didn’t believe until it actually happened. And we had no idea who was calling. No idea. So it really was quite a surprise. We were very excited. And the way it was presented in a letter afterwards? It was kind of like a gentlemen’s agreement. That’s kind of really what it was. I was just glad that we had the opportunity to do that. 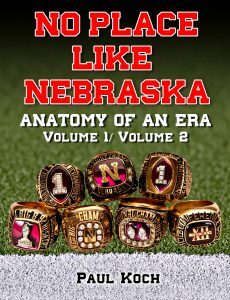 Q: So you and your brother were pretty determined that you wanted to be Huskers early on? DS: Yes, and I think a big part of that was the influence of football at a young age from my parents and grandparents being long-term Husker fans. I would classify it as the ‘classic Husker fan’ if you really dig into true Husker fans, as you pass these tickets down the family tree. I remember getting in the car and driving two hours from Albion, Nebraska to Lincoln, making a day trip out of it, and always driving home late after the game. It was something I always looked forward to. My grandmother, she never missed a game. I remember taking her to her last game before she passed away. I remember she was 82, and I remember it was her last game. And she died when she was 83 -didn’t make it to the next season in 2003- you could just see the tears in her eyes as she was leaving the stadium and probably knowing she wouldn’t ever be back again, because she’d been going to games for close to 50 years. And you look at that: that’s the true Nebraska fan. I still look back at that today when I go. I actually use my great uncle’s tickets. My great uncle Lloyd Schmadeke played baseball for Nebraska back in the ’30’s, and he’s had tickets forever. And he’s 93 now and can’t go, so I use his tickets now and then. Still tough as a tack, he just can’t get up the steps and go to the games but he enjoys that I get to take my kids and continue the tradition. Q: It must have been a banana republic! Q: So when you finally arrived on campus and got into the swing of things, what stood out to you the most? DS: You know, when you come from a small town in Nebraska like a lot of Huskers, you come out of there and you get asked to walk on, you’re kind of the big fish in a small pond at that point, and then you realize you’re really a small fish in a big pond when you get with some of your classmates and the great players who get recruited in on national scholarships, talent-wise. That, for me, made me realize what I was associated with. This was big time. That was the biggest thing for me, along with that first game. I remember when we played the first night game my freshman year. Of course I didn’t play, but I was a walk-on and I got to suit up, and we played Washington. You remember that game? Steve Emtman was with Washington at that time, and seeing him and doing the tunnel walk and walking out into the stadium for the first time? At that time 76,000 to 78,000 screaming fans all in red was amazing just being on the sidelines. That was something being on national television, just putting it to reality, something I’d seen on TV over the years. I’ll never forget that first night game. There was one of the Huard brothers and Napolean Kauffman. That was a good team. Q: Was that when freshmen still reported a week early to camp? DS: Yes, that was true, we did. I don’t really remember a lot about that week, but they were really trying to get us prepared for the three-a-day practices. You know, that’s something that I think every football player dreaded, no matter how many years you were there. I remember working out at home and running up and down the hills and lifting weights trying to get prepared for it. I was not going to show up for training camp not in shape in any way or form. Granted, I could have been in a little better shape, but I was running and trying to get in shape the best I could, and that really helped me with some of the endurance and the two-three hour practices we had. I think overall, looking at that my freshman year, I remember at that time the walk-on program was quite big at the time. And it was amazing that every practice was filmed. You had Moose and Carp up on the scaffolding, and I remember we had enough players that we could have four different games/scrimmages going on at one time. (laughs) And I was thinking, ‘They’re watching every move you make out here.’ And obviously that’s what they did, and the meeting the day after we’d watch the film. And we’d watch the game film of the upcoming team that week and we’d review every step. You had to take five steps on post square-ins, and if you were a wingback or split end and if you took four, they knew it. I was amazed at the detail, the precision they had at running the routes correctly. Q: What position did you play, Darren? DS: Well, I was under Coach Ron Brown first. My redshirt freshman and my true freshman season I was a wingback/receiver under Coach Ron Brown, and then I transitioned to a cornerback under Coach Darlington my sophomore, junior and senior year. Q: Tell me about Coach Brown. DS: Coach Brown is a class act individual all the way around. I’ll never forget him, he was always one of the coaches who took pride in doing little mini-drills after practice. He took pride in being the last group to come off the field. We’d typically run little routes and have defensive backs cover you, or as receivers we’d cover guys and try to use alligator arms in catching the ball and then stripping it out of them. He was always throwing balls at us, it seemed like. But that taught me something -because you know, you pick up a lot of things you use later in life– he taught what it took in order to be great. He always said that you had to do the little things. I’ll never forget that, “The little things that you do in life will pay off. This is why we’re here today. And everyone else is gone in the locker room and showered up and we’re still working, because I want your guys to be the best you can be, the best blockers or what have you.” One thing at the time. We weren’t throwing a lot at that time and he took a lot of pride in his role in pulling his fair share of the weight for the team in training & coaching excellent blockers with the split ends, wingbacks, et cetera. That’s something, because if you look through the years you see our success with running the ball was because we’ve always been very good at having receivers who could block downfield. Q: Any special techniques you receivers used in blocking downfield? Any the average fan wouldn’t realize? DS: You know, that’s a great question. Basically, he’d emphasize us practicing it. And that’s one thing from those times: other schools didn’t really put the emphasis and the focus on practicing to be good blockers downfield. That’s one thing he really stressed, “To have these I-backs breaking 50, 60, 80 yard runs, this is what we need to have.” It was something that, at the time, a lot of the receivers in that group realized that we weren’t going to be the J.J. Stokes receivers, because we weren’t throwing that much, but we knew our role was very, very important in contributing to the success of the team, and blocking downfield was it. He talked about “the defensive backs and the linebackers are the ones who are going to be catching the running back, and we’ve got to be doing our part,” and if we weren’t and we reviewed that in the film the next day we were called to the mat on it, “Either you hit them too low or hit them too high.” That’s something I remember about him. He was a big Christian. I think he was part of the Fellowship of Christian Athletes. He was very similar to Coach Osborne: I never heard him say a curse word, ever. Coach Osborne was that way, as well. I think Osborne’s worst words were ‘dadgumit.’ You looked to him as a coach, a mentor, a leader. Coach Brown was incredible. He really became kind of a mini-father figure with that position for a lot of receivers. Coach Ron Brown really cared about you as an individual. And something I remember, after each game he’d go to the 50 yard line and begin a circle and say a prayer thanking the Lord. And that’s something, too, that a lot of players really were looking at the spiritual side of their lives. Q: Were any particular teammates more inspiring or better leaders? DS: I would say, at the time looking up to David Seizys, he was two years older than me at the time. He was a true leader. Coach Brown really liked him, as well. He was a walk-on and eventually earned a scholarship. Tyrone Hughes was there, he was big. Tyrone Legette was on the defensive side, running routes against him. Toby Wright as well, he was a safety at the time. It’s something that, overall, everybody in the group was really nice, and it was something that I’ll never forget. I really enjoyed the time under Coach Brown. And I want to tell you a story, which I think is pretty funny: at the time we were doing one-on-one drills where I was on the receiver’s side and we would run routes. (I never really had great hands at catching the ball, okay?) I was a running back in high school and I never really was thrown the ball that much, but I remember I’d get a little nervous with Coach Osborne standing there and watching with Mike Grant or another one of the quarterbacks throwing to us as one of the defensive backs would cover us. Well, I’d always get nervous for that, for whatever reason, and sometimes I’d drop the ball or whatever. One time during practice -and this was my second season as a wingback- Coach Brown pulled me aside and said, “You know, Darren, I’d like to make a suggestion to you and kind of get your thoughts on this, but it might be a good move,” and he told me, “Darren, the thing is… you’ve got hands like feet.” (laughs) I’ll never forget that! “I think I’d like to propose to you that you move over to the defensive side and be a cornerback.” And I kind of looked at him and said, “I thought you’d never ask.” (laughs) So that’s really the transition of when I went over to the defensive side, and that was really a much better fit and role for me. I was much happier swatting the ball versus catching the ball and I got to play a lot more and everything. I’m glad that he as a coach recognized that and switched me over. Q: “Hands like feet,” huh? DS: Yeah, I didn’t argue with him. (laughs) It was like, ‘Okay.’ It was funny, and then we went from there and I transitioned under Coach Darlington for the next three years. Q: Tell me about George Darlington. DS: Coach Darlington? Great guy. He always had a big -at the beginning of the year in the fall when we were reporting- he’d have us out at his house. He lived out east of Lincoln on a nice little acreage. He’d have all the defensive backs out once a year for a cookout/grill out. We’d play video games, have his pool table, met is family, his daughter, his wife. And Coach Darlington was always a big Snapple guy. He used to drink a lot of Snapple at the time. I’ll never forget that. He’d have a case of it, a case or two in his office all the time, he’d just drink that like nothing else. I‘ll always remember that. But we had a lot of fun with him. He was very good at reviewing game film, as well. We watched a lot of game film in his office, watching game film and critiquing routes as well. Very meticulous, very good at giving technique and suggestions. He was a little different person than Coach Brown, a little more down-to-business, per se. I learned a lot from him, as well. He’d been under Coach Osborne there for quite some time, and I had a chance to get in to play a few times for home games. My sophomore year, I remember playing against UCLA and I covered J.J. Stokes at one time; I knocked a pass out of his hands or knocked him out of bounds. It was my highlight of that game, was covering J.J. Stokes. He went on to become a great professional athlete. And I did letter my sophomore year, so I lettered three years in a row up through my senior year. My junior year I played a lot more, I traveled every game my junior and senior year. There was one game I didn’t make it -I think it was Oklahoma State- but after that I was backing up behind Tyrone Williams and Michael Booker. I was the backup between those two and got to be on the travel roster, the top 60. I believe they only took sixty players, if I recall, to the away games. And I worked kickoff and punt returns. I think against Pacific, a small college out of California my junior year, I got in to play the later part of the first quarter and played the second, third and fourth quarter. I’ll never forget walking out after the game and I heard the radio announcer mention that “Darren Schmadeke had 9 tackles and led the team in tackles as a defensive back.” I don’t know if that’s a good thing or not, but good for me. (laughs) Typically it’s the linebackers. But the next week I got presented a nice little plaque from George Darlington as Defensive Back of the Game, and it had a nice little quote on there about character. It was fun playing in front of the home crowd and getting a bunch of tackles in that game. And looking into that junior year we end up going 13-0 and going to the Orange Bowl. We went to the Orange Bowl four years in a row, counting my redshirt year, and then my senior year we played in the Fiesta Bowl and beat Florida. That was pretty good. And I remember the three years, my sophomore, junior and senior years we were 36-1, losing to Florida State and Charlie Ward. It was just one of those games. We had it, and I don’t blame Byron for missing it at all. We shouldn’t have been in that position, from my line of thinking. After that game? I remember even spring ball, on the clock would say 1:16. We had it won at that time and then lost it, and we used that as a reminder of where we were, how close we were. I remember Tommie Frazier at the time basically being such a huge motivator. Him and Christian Peter. They were two of the real prominent motivators of the team. When we came into my junior year -the ’94 season, Osborne’s first championship season- it just seemed that we were destined to win every game. It was expected. The confidence level? I’ve never seen it higher. We just knew we had to perform every week, one game at a time, to get that perfect record. Looking back I’m just in awe that we were able to do that. Just the confidence in the teammates and mentors, the captains at the time. Their leadership was pivotal in our success that year, as well as the following year. And they expected everybody –everybody- to raise their level of play. Even the backups and walk-ons, they all played their part in special teams. Everybody played at a higher level because we knew our teammates were counting on us and we were gonna win the national championship that year. Q: When you say ‘a greater effort’, how would you typify that? DS: Everybody was so focused on the end result of going to the Orange Bowl and winning a national championship, they took every practice seriously, every game seriously. I think we learned a lot from the ’92 Iowa State game when we lost 19-10 over in Ames, one of Tommie Frazier’s first or second games when he started playing a lot. We’d never lost to Iowa State. It was an embarrassment, something we were never going to let happen again. I remember Coach McBride, at the time -in ’93 and ’94- he would reference that periodically. And all he would have to say was, “Remember Iowa State.” That’s all that needed to be said, and we never forgot that. That’s one game that we overlooked and were just not prepared and mentally ready to play at the top of our game. And I think it shocked everybody. It was a real eye-opener, a pivotal turning point for our teammates to see what we had to do and take care of our business each and every week and not to look over any team that we play. Because any team could knock us off, and if you had one loss that could ruin the whole season and the possibility of a national championship game. It even happens today, you trip up in your championship game and things fall apart. DS: One thing I’ll say about him: a class act individual. A very strong Christian, somebody who I have a lot of respect for. I remember first seeing him when I was probably in junior high, he came to our school for a speaking engagement and one thing about him (a lot of players probably say this), he had such conduct and such respect, everybody respected him, all levels of the players. I remember sitting in the meeting room, the tiered room with all the meeting chairs, and everybody would be laughing and joking and teasing with the guys, but when Osborne would walk in at 2 o’clock for the meetings it was complete silence. You could almost hear a pin drop. I don’t ever remember him having to say, “Okay guys, can you hold it down again?” When he walked into the room we knew it was business, the attention was on him and he had the floor. That really sums it up. Being that he had a Doctorate in Psychology, he really had an amazing ability to adapt and really get to know each individual player on a personal basis. And I’ll say this, he would really take pride in studying the new freshmen coming in and getting to know them as they moved up the ladder of the team, knowing everybody by first name. 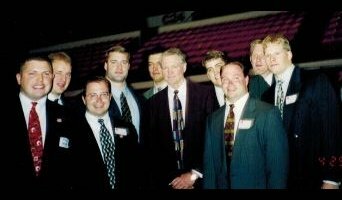 And out of all the coaches – Darlington, Brown, Steele, all those guys, my nickname in college was “Schmad”- but Coach Osborne was about the only coach who could differentiate between myself and my twin brother, Damon, and he always called me ‘Darren.’ He always called me by my first name. He had an amazing ability to really get to know people by first name. I remember a lot of times you’d see him down the hallway and he’d actally stop and talk to you. He’d say, “Hey, Darren, how are you doing? How is school going for you? Doing well in your classes?” Really personal things like that. I was really shocked he’d ask that. That meant a lot. Basically, he really showed he cared about me as an individual and being a contributor to the team no matter what my role was. It made you feel special. It really did.